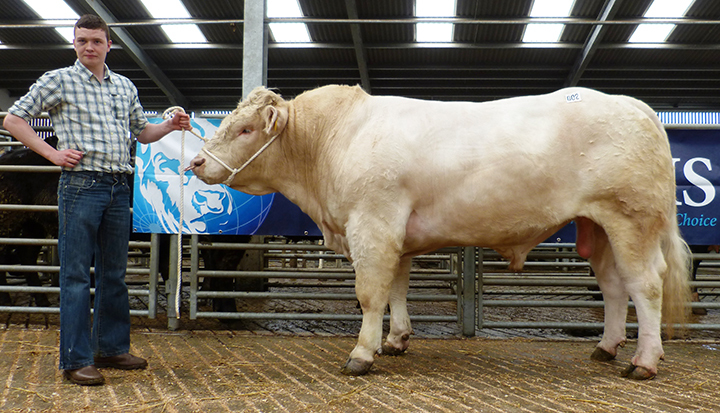 A small offering of Charolais bulls saw a high of 3,100gns at the Northern Ireland club show and sale at Ballymena on Friday 10 June. 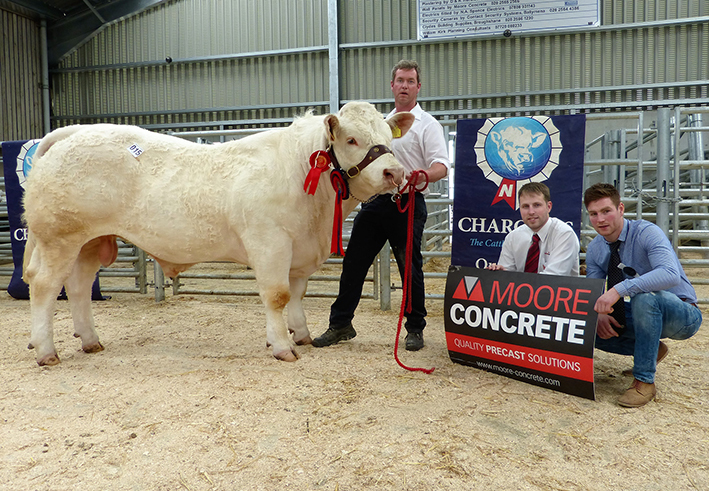 Topping the sale at 3,100gns was Pat Hackett, Clogher, Co Tyrone with the 15 month old Fury Link. Link who is out of the homebred dam Fury Glitter going back to Lyonsdemesne Tzar and sired by the 25,000gns Stirling Intermediate Champion Inverlochy Ferdie went on to Kilwaughter, Co Antrim to work for Matthew Workman. Following on at 2,350gns was the class winner and Alwent Goldbar son Bessiebell Lego. This March 2015 born lad consigned by J Smyth, Newtownstewart, Co Tyrone, caught the eye of A Stevenson, Ballymoney, Co Antrim. Next to go from Eamon McGarry, Broughshane, Co Antrim was Deerfin Libra who earlier in the day had been tapped out as the reserve champion by judge Gerard McShane. This 16 month old sired by the 14,000gns Goldies Usher was knocked down sold for 2,250gns to Ian Gibson, Broughshane, Co Antrim. The Supreme Champion Rawbrooke Judge was the next to sell for 2,200gns. 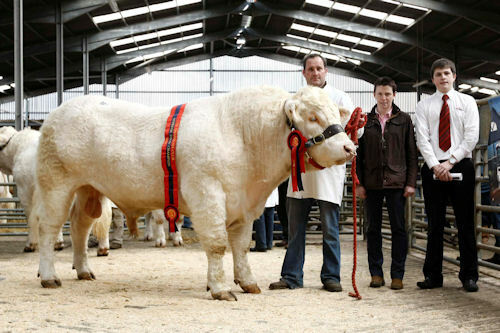 This September 2014-born bull was purchased by William Whyte, Portglenone, Co Antrim, was exhibited by Clive Hoey, Fivemiletown, Co Tyrone and is sired by the 25,000gns Supreme Perth Champion Thrunton Socrates. 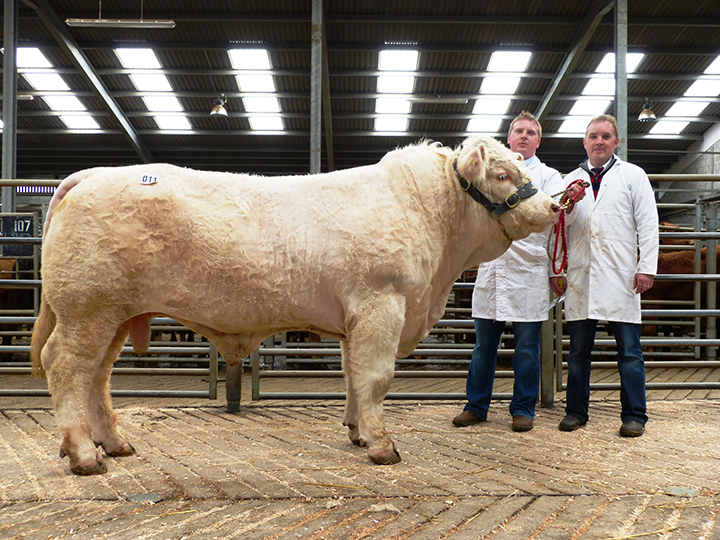 Finally selling at 2,000gns was Burnside Lusher an entry who stood second in his class for Brian and William McAllister, Ballymena, Co Antrim. Messrs A and J McClelland, Ballyclare, Co Antrim were the men behind the money on this 16 month old 14,000gns Goldies Usher son. A small consignment of Charolais sold to a top price of 3,000gns at the Northern Ireland club sale in Ballymena on Friday 17 April, judged by sisters Eimear & Caoimhe McGovern. The top price of 3,000gns went to the 19 month old Stranagone Ican ET TI +29 SRI +28 from Robert McWilliams, Maghera, Co Derry. This Oldstone Egbert son went to Hugh Doherty, Randalstown, Co Antrim. 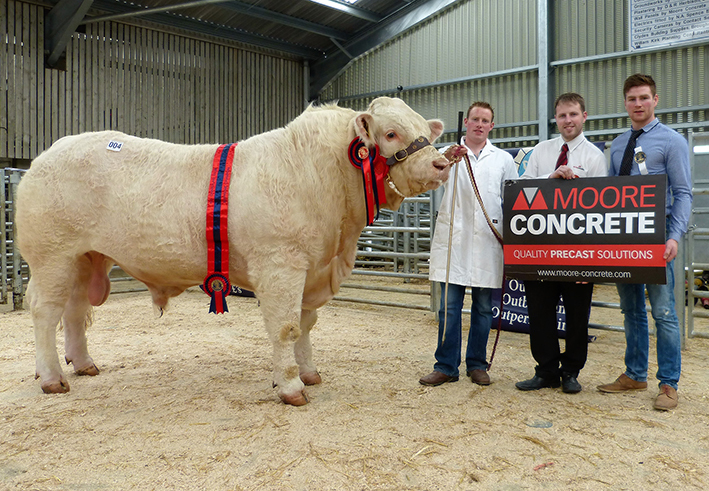 Next to go from Brian McAllister & Son, Ballymena, Co Antrim was the Reserve Champion Burnside Inspire ET TI +39 SRI +44. 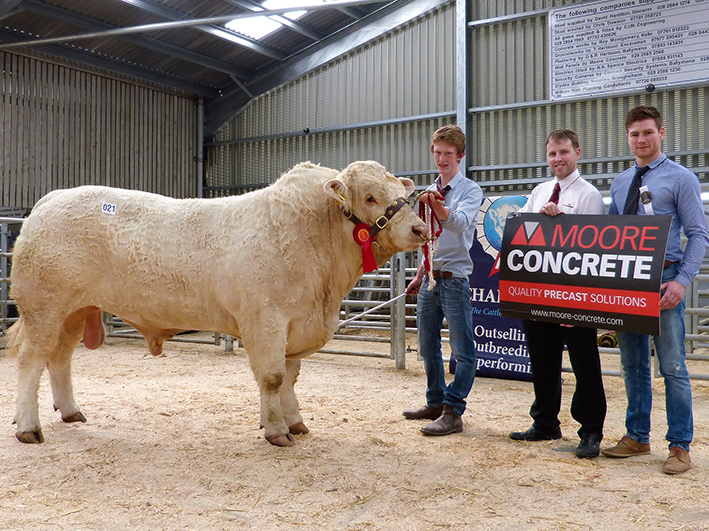 The 18 month old sired by Blelack Digger was knock down sold for 2,800gns to Alex Burleigh, Ballymena, Co Antrim. Then Cargin Icarus, a 16 month old 10,000gns Supreme Perth Champion Thrunton Bonjovi son from M and E Murphy Newry, Co Down was purchased by J McCracken, Randalstown, Co Antrim for 2,400gns. Lastly selling at 2,300gns and 2,200gns respectively for exhibitor Gilbert Crawford, Maghera, Co Derry were two sons of the 12,000gns Maerdy Fiend. Coolnaslee Islander was sold to Patrick McKendry, Ballymoney, Co Antrim and the 15 month old Coolnaslee Jason sold to J Taylor, Ballymoney, Co Antrim. 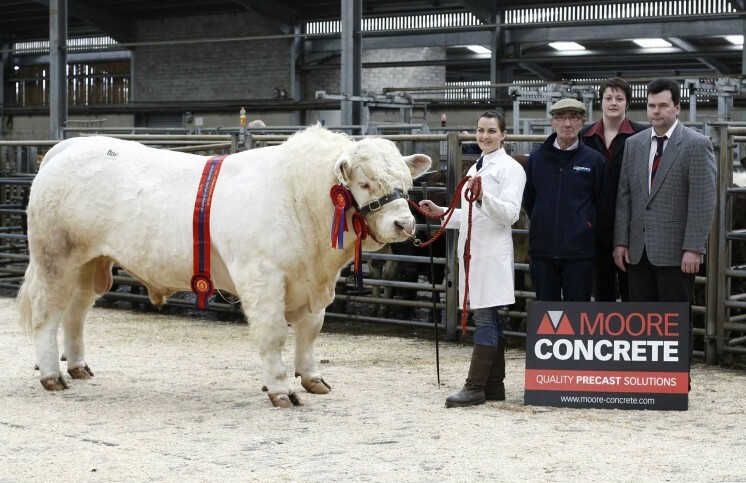 Charolais sold to a top of 3,500gns twice at the breed’s Northern Ireland Club sale which featured a small entry of 11 bulls forward in Ballymena on Friday 25 April. First through the ring at 3,500gns was Ballyreagh Hero, a 22 month old Mogador son bred by S Somerville and offered by Patrick Grue, Lisnaskea, Fermanagh. The buyer was JH Fraser, Glencairn, Belfast. Next entry in the ring was another 22 month old from Mr Grue, this time the homebred Kilturk Hero, a Cottage Devon son making 3,000gns to John McKeague, Ballymena, Antrim. The day’s second leading 3,500gns call was made by David McClurkin, Ligoneil, Belfast for Aughafad Harry, an 18 month old Thrunton Voldemort son from RH Sinnamon, Pomery, Tyrone. 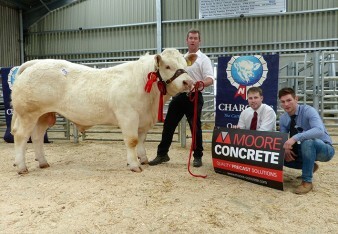 Next at 3,400gns was Coolnaslee Harold, a 17 month old by Corcreevy Dingle from Gilbert Crawford, Magherra, Derry. The buyer was TA Fenton, Ballymena. 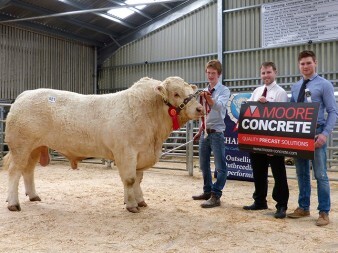 Charolais trade topped at 4,400gns at the Northern Ireland Charolais Club’s show and sale at Ballymena Livestock Mart on Friday 19 April. 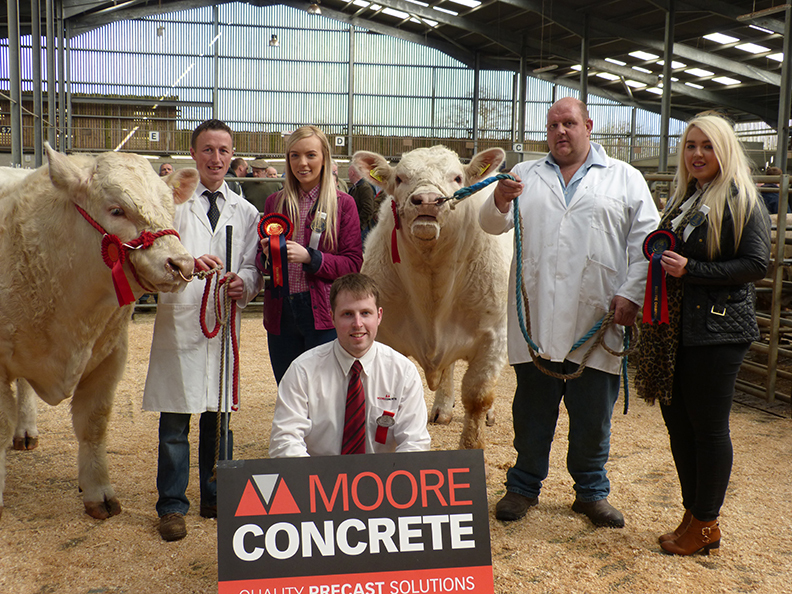 The top price of 4,400gns went to the day’s supreme champion Crosskeys Gomesy from C and K Marshall, Ballymena, County Antrim. This 19 month old by Bassett Judge and out of a homebred dam was purchased by C Maxwell, Downpatrick, County Down. Knocked down sold at 4,300gns was first prize winner Moorlough Hugh by the 55,000gns Thrunton Voldemort and out of a homebred dam sired by Oldstone Egbert. 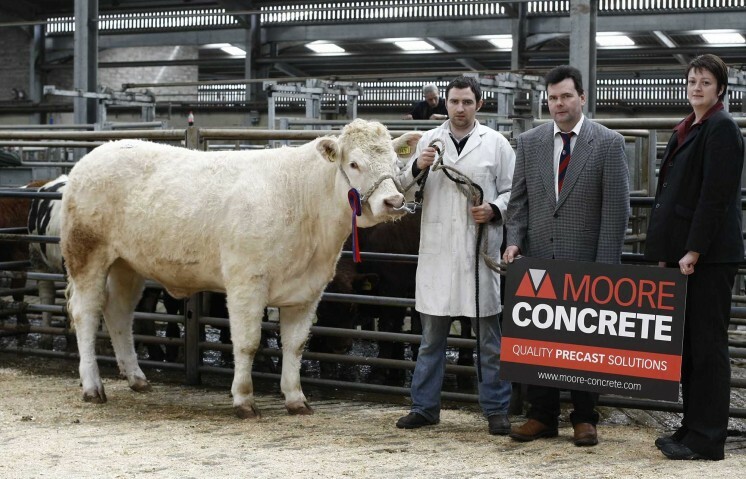 Bred by J McBride, Strabane, County Tyrone, the 14 month old Hugh was secured by J Smyth, Randalstown, County Antrim. A call of 3,900gns was made for Adams General, a 17 month old by the Doonally New sired Melvin Gal and out of Kilnock Varanasi. Bred by E Reid, Omagh, County Tyrone, General was consigned by K C Veitch, Lisbellaw, County Fermanagh and bought by T McCaster, Larne, County Antrim. 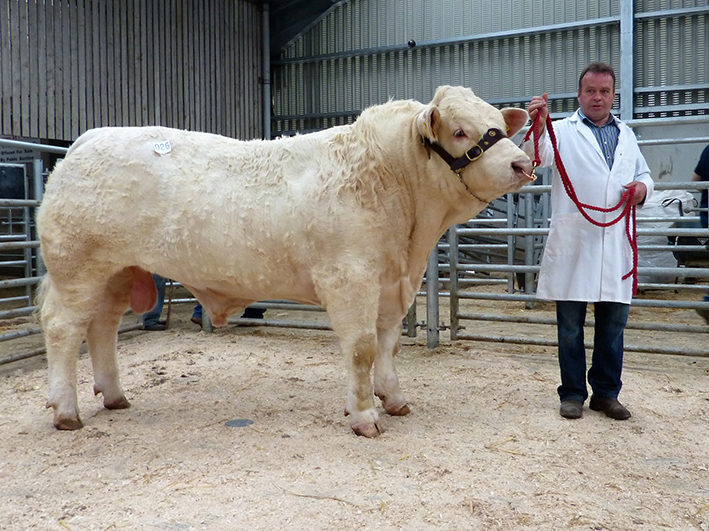 Burnside Honky ET sold for 3,000gns to D McCollum, Ballymena, County Antrim. Bred by B McAllister and Son, Ballymena, County Antrim, this 14 month old was by the 16,000gns Clyth Diplomat and out of a homebred dam. 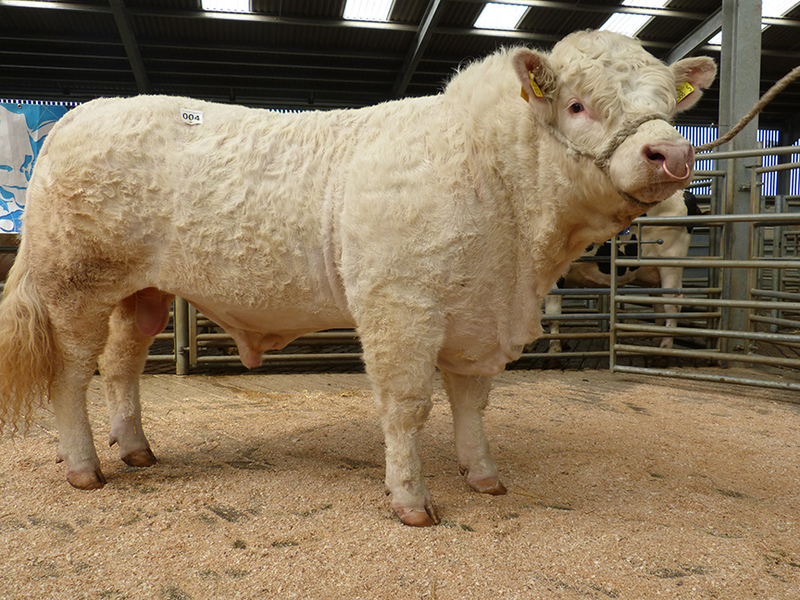 Charolais bulls went to 4,000gns twice with an overall average of £3,027.50 at the Northern Ireland Charolais Club’s official April show and sale at Ballymena on Friday 20 April. First to be knocked down at 4,000gns was the 20 month old pre-sale supreme champion Killadeas Fearless TI +20, SRI +20, also taking home the Simpson Trophy. By the 18,000gns Derryharney Outstanding and out of a home-bred dam by Oldstone Egbert this entry from S and D Bothwell, Ballina Mallard, County Fermanagh was purchased by D Rainey, Ballymoney, County Antrim. 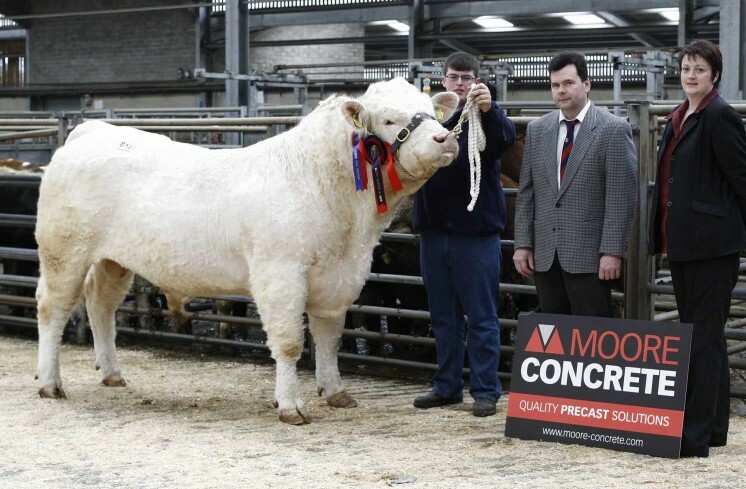 The pre-sale reserve supreme champion, Coolnaslee Foremost from G Crawford, Maghera, County Derry also sold for 4,000gns. By the 9,000gns Goldies Carnival and out of Mullagh Sylvia, this 17 month old was secured by a bid from R Workman, Larne, County Antrim. Kilturk Frank by Anneskeagh Ulysses and out of Rossharbour Augusta went for a call of 3,400gns. Bred by P Grue, Lisnaskea, County Fermanagh this 17 month old was acquired by J Gilfillan, Limavady, County Derry. A call of 3,100gns won 15 month old Cargin Gallant ET for Glencrew Farms, Aughnacloy, County Tyrone. This one was bred by M Murphy, Newry, County Down and was by Oldstone Egbert and out of Monksland Claire. Female trade saw only one lot entered with 14 month old Rowandale Gem from D McKay, Ballymena, County Antrim selling for 1,200gns. Out of Rowandale Drake and a home-bred dam, she was knocked down sold to P O’Neill, Toomebridge, County Antrim. Averages: 9 bulls, £3,027.50. 1 yearling heifer £1,260.